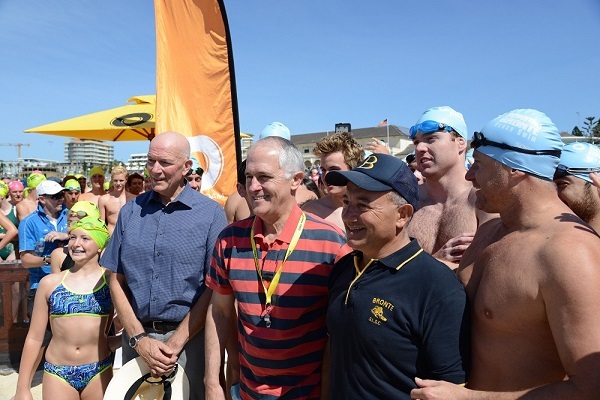 2015 saw two firsts for the Bondi to Bronte Ocean Swim, with Prime Minister Malcolm Turnbull as our official race starter attracting news crews and plenty of swimmers taking the opportunity to grab a selfie with the PM.It was also the first change of course in the 15 year history of this iconic event. Sadly, due to large and dangerous surf conditions we were forced to cancel the Banana Boat Junior Ocean Swim and Bronte Bay Swim. The extreme ocean conditions at Bronte were also deemed too dangerous for the regular B2B course to be set and as swimmer welfare is our highest priority, the swim was amended to be a Bondi Bay swim of approximately 1.8km.With the decision made at 8am, it was a mammoth task to pack up and relocate of all the race infrastructure, volunteers and rescue equipment required to hold the swim at Bondi. The challenge was met head on by our fantastic volunteers in and out of the water, and we send our most heartfelt thanks to all those that made it happen with such a positive attitude.A fantastic reflection on our club spirit and comradery. Despite the revised course we had a record 350 on the day entries with a total of 1,681 finishers.Congratulations to all finishers, in particular our Elite winners Jarrod Poort and Yumi Kida. Fundraising for The Kids Cancer Project is a big focus for our swim entrants and this year swimmers raised a mammoth $40,000 to help find a cure for childhood cancer. Truly an outstanding effort. Of course, we must thank all our sponsors without whom the event would not be possible.Our major sponsor Macquarie Group outfitted our volunteers in event crew shirts and caps, the swimmers were able to capture fantastic memories of their swim at the Macquarie photo booth, and take home a fantastic B2B swim bag for use all year round. Thanks to Rebecca and Amanda for being so involved on the day and tackling the relocation with great humour. Thanks to Banana Boat for ensuring all the swimmers, their supporters and family, and all beachgoers on the day were well covered in factor 50 sunscreen.The roving sun police are an event favourite, and the spray applicator a real crowd hit. Our swimmers and volunteers were kept well hydrated compliments of Mt Franklin who went above and beyond to provide 2000 bottles of water in record turnaround time.Thanks too, to Speedo who have been long standing supporters of the club and the event, providing our swimmer caps and all the event prizes, a most appreciated contribution. A special mention to David at Moving Home Removals who worked tirelessly throughout the event to transport our equipment back and forth between beaches. A big thank you to Kate Ford for your outstanding event management skills, we could not have done it without you. Thanks also to the Waverley Lifeguards who are so supportive of our club ensuring that we were able to hold a swim in any format.Finally, to our Race Director Stephen Ford, your knowledge and experience on the day was as always invaluable and exactly what was needed this year! 2014 was another great year for Bondi to Bronte Ocean Swim. Once again, perfect weather and good conditions in the water allowed us to offer a memorable swim to the participants and an enjoyable day at Bronte SLSC to the public. With over 2,000 people entered across our 3 events, the iconic Bondi to Bronte swim has confirmed its place as the largest 2km+ swim in NSW and the 3rd largest 2km+ in the Australia, behind Lorne Pier to Pub and Rottnest. We are incredibly proud to maintain this position since first achieving it last year. Macquarie Group, our major sponsor has delighted swimmers, public and volunteers with their roving photographer, Polaroids, lucky draw prizes and the volunteer gear. The Bronte Bay, launched in 2013, attracted more than 100 swimmers. This swim event will continue to grow through, offering those who are not at the B2B level an opportunity to still be a part of the iconic day. We continued to grow the Banana Boat Junior Ocean Swim, thanks to Bronte’s long time Club sponsor Banana Boat, new supporter Bennett Boards and our friends at Speedo.Bronte Junior Ocean Swim has now become the biggest Junior Ocean Swim in the country! Congratulations to the male elite winner, Wally Eggleton, on the 1st ever back-to-back win by a male elite and 2nd fastest time ever (22min 47sec)! What would a swim be without a cause – as you know we are passionate about helping The Kids’ Cancer Project find a cure for childhood cancer. Through the outstanding efforts of the fundraisers, the 2014 Bondi to Bronte raised more than $31,000 for The Kids’ Cancer Project! The feedback received from the swimmers has been very positive; they have been especially impressed by the large numbers of water safety personnel and by the friendliness of the volunteers in general. All of these great accomplishments could not be possible without our members – more than 200 wonderful volunteers whom continue to dedicate their day for this event. This event is the most important event on the Club’s annual calendar; it is testament that Bronte SLSC really is a big community and the members can stage such a wonderful event. Huge thanks from Bronte SLSC to all who helped out on the day! The event would also not be possible without the support from our sponsors and supporters.We would like to give thanks to Macquarie, Banana Boat, Speedo, Bennett Surfboards, Watssup, MovingOz, Powerade and Ozify. It is also encouraging to see the post-event presentation in the Club attracts more people year-on-year with a variety of lucky draw prizes being distributed. In 2014, we have paid a special tribute to 17 special swimmers who completed their 14th Bondi to Bronte. They were celebrated by Neil Rogers (Race MC & Olympic swimming legend), Basil Scaffidi (Bronte SLSC President) and Graham Ford (SLSA President & Bondi to Bronte Ocean Swim founder) during the presentation and were given a personally dedicated Bondi to Bronte Legends limited edition linen print designed by local artist Sian Faber. What an incredibly significant year 2013 was for the Bondi to Bronte Ocean Swim. Once again the Bronte SLSC spirit was out in force to make 2013 the best year yet! We were thrilled to welcome a new naming rights sponsor, Macquarie Group, whom delighted swimmers with their “celebrate your swim” photo booth, provided lucky draw prizes and the volunteer gear. We launched a new adult’s event – The Bronte Bay, attracting more than 250 new swimmers. This swim event will continue to grow through offering those who are not at the B2B level an opportunity to still be a part of the iconic day. We continued to grow the Bronte Junior Ocean Swim, thanks to Bronte’s fantastic long time Club sponsor Banana Boat, new supporter Bennett Boards and our friends at Speedo. It was fantastic to see so many Nippers from Bronte and surrounding Clubs participate and complete the course, which for some was their longest or first ocean swim. We helped our charity partner hit a significant milestone. Through the outstanding efforts of the fundraisers, the 2013 Bondi to Bronte raised more than $40,000 for The Kids’ Cancer Project. This takes the grand total raised by Bondi to Bronte swimmers over the past 3 years to over $100,000! These funds support clinical trials, research and treatments to help find a cure for childhood cancers. If all that wasn’t enough - the iconic Bondi to Bronte 2.2km swim became the largest 2km+ swim in NSW and the 3rd largest 2km+ in the Australia, behind Lorne Pier to Pub and Rottnest, in 2013. We are incredibly proud to have attracted more swimmers than the Cole Classic’s 2km and ALL of the other heavily promoted ocean swims in the country. The feedback received has been very positive. Many commenting on the friendly and helpful volunteers at registrations and on the beaches, assistance shown by all event volunteers and the large numbers of water safety caring for the swimmers. All of these great accomplishments could not be possible without our members – more than 200 wonderful volunteers whom dedicated their time and efforts to helping ensure Bondi to Bronte is a success. This event is the most important event on the Club’s annual calendar; it is testament that Bronte SLSC really is a big community and that the members can put on such a huge event. We can’t thank you or celebrate the efforts of all volunteers enough. From the preparations to get the Club and equipment ready, to set up and manning all the stations and then the passion and attention to ensuring each swimmer has a good experience is such a huge feat. Thanks to every member and volunteer who help us make Bondi to Bronte such a success each year, especially in 2013. The event would also not be possible without the support from our sponsors and supporters. We would like to give thanks to Macquarie, Banana Boat, Speedo, Bennett Surfboards, Grace Self-Storage, Schick and Kellogg’s. We would also like to thank the incredibly talented team from 2LittleFish who produced a brilliant video of the day. Also a huge thanks to Bronte VC James Lawrence and the adventurous Mark Tipper, whose incredible underwater and on-water images have captured many of the superb aspects of our wonderful event. We look forward to Sunday 7th December 2014 for the 14th running of the Macquarie Bondi to Bronte, the Banana Boat Bronte Junior Ocean Swim and the Bronte Bay Swim. Lock it in your diaries, calendars and phone’s now! The Bondi to Bronte Ocean Swim is truly one of the most challenging and beautiful headland swims, all members should be so proud of the growth and support this event attracts.